Palestinian Arabs in Montreal mark "Nakba Day" by carrying a 66-meter-long PLO flag. The Palestinian Arab community in Montreal on Sunday marked “Nakba Day”, the day on which Arabs mark what they view as the “catastrophe” of the establishment of the State of Israel. 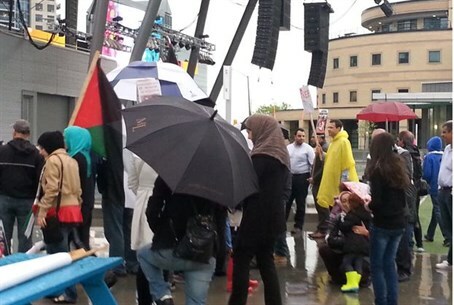 Shalom Toronto reports that during the rally, a Palestine Liberation Organization (PLO) flag at a length of 66 meters was waved, marking 66 years since the “Nakba” took place. The protesters marched through the streets of Montreal chanting pro-Palestinian and singing national songs. The organizers of the rally gave speeches in Arabic, English, French and Spanish in which they spoke of “the ongoing suffering” experienced by the so-called “Palestinian refugees” since 1948 and stressed the importance of adherence to the legitimate rights of the Palestinian people, primarily the “right of return” of refugees and their descendants who left their homes during the War of Independence in 1948. The organizers of the rally noted that the long PLO flag that was waved during the protest was designed to express the relationship of the Palestinian community in Canada with its homeland. On May 15, “Nakba Day” was marked by the Palestinian Arab community of Mississauga, west of Toronto. That event was attended by only a handful of people because of heavy rain that day.